The first trailer for Fallout 4 manages to cram quite a few things in a span of three minutes, ranging from references, to potential gameplay mechanics. Lets take a closer look, shall we? This does not seem like a detail that is simply window dressing. The rest of the trailer regularly flashes back to pre-war moments, making it seem as if Fallout 4 will explore stuff outside the post-apocalypse, too. 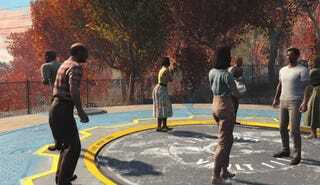 Vault-Tec in particular is mentioned at this point, which is the company that built the vaults that people hid in to save themselves from nuclear catastrophe. This dog looks a hell of a lot like Dogmeat, a mutt that first appeared in Fallout 1 as a Mad Max reference (the dog used to belong to a character that wears the same armor as Max). Since then, Dogmeat has appeared in pretty much every Fallout game there is. So...lets call him Dogmeat here, too. Classic 1950’s decor, but more importantly, that robot right there is a Mister Handy, whom you might remember as the totally competent mech that ruined your birthday cake in Fallout 3. While this scene unfolds, the trailer also plays audio of what seems to be a radio transmission. Someone is trying to make contact with other stations, but is having no luck. It sounds like it’s a transmission that happens shortly after the war started, as the fiction posits that there was much confusion about who dropped the bombs first—and this guy clearly doesn’t know what in the world is going on. Hooray for a post-apocalypse that is not green and drab! People are packing their bags, trying to get the heck out of dodge—meanwhile, the government blazes by overhead in a Vertiberd, without a care. They’ve got guaranteed vault space, after all. See the guys in armor there? 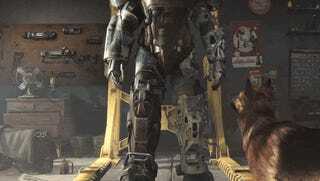 That’s the Enclave, policing who can and cannot get into the vault. Spoilers: most people could not secure vault space...but it’s difficult to feel bad, considering the vaults were actually just glorified testing labs. I digress. This is where the trailer picks up the pace, and starts showing us a variety of locales and enemies one after the other. 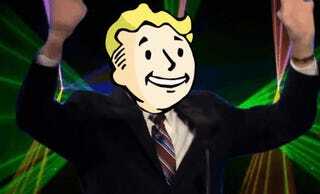 First, we’ve got Brahmin and barter confirmed. Is that the Enclave though? Or the Brotherhood of Steel? Hard to tell. EDIT: As our reader Collin Olson points out, it’s likely these are Super Mutants—see the cages nearby? Yeah. Super mutants love imprisoning people in those. Looks like some portions of the game will indeed be very brown. Perhaps this Deathclaw is closer to a location that got hit by radiation? Note the guy in the baseball outfit, as well as the giant weaponized baseball bat on top of a building? Not to mention the baseball store in the screenshot before this? Baseball must be pretty big in this town! I can’t possibly imagine why. It’ll be cool to see how that love influences the design of the game, though. Damn. Like I said...most people didn’t make it back then. And again: do the constant flashbacks mean we’ll get to play some of this stuff? Hopefully that’s the case—it would be a welcome change of pace for the series. A few things here. One, looks like bobbleheads are back. Two, there are a variety of energy weapons here, in what appears to be a workshop. Will we see a crafting system like that of New Vegas? And more importantly, if this is indeed a workshop, will we get to build our own suits of power armor? Power armor is the most iconic gear in the game—and being able to customize them would be huge. It certainly looks like this Power Armor is in repair, at least. 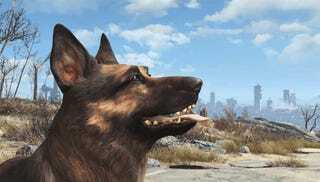 And finally, our closing shot: Dogmeat, being a good boy, yes he is!! 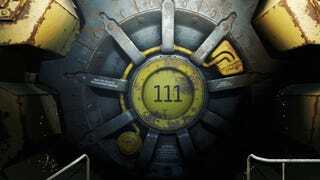 Pipboys are still in, naturally, and it looks like the main character might be someone from Vault 111. That’s the same vault from the scene where people get blown up by an atomic bomb. Nothing major, and yet these last few seconds have what is potentially the biggest bombshell in this entire trailer: the character speaks. The Institute existed long before the Great War, but was originally known as the Massachusetts Institute of Technology(MIT). It is known that Robert House attended the Institute in his youth. After the Great War, the Massachusetts Institute of Technology survived, but became known to the people of the wasteland as a secretive organization known only as the Institute. Allegedly, it is currently located within the Commonwealth, the name now given in the post-atomic world to what was once the American state of Massachusetts. Little is known about the Institute aside from rumors circulating around the scientists working in the sealed environment. The Institute possesses highly advanced technology and technological skills, resulting in the creation of true artificial intelligence (AI), and are capable of creating androids. Given that The Replicated Man was one of the best quests in Fallout 3, I’m pretty excited to see more of where that came from. The trailer also put a lot of focus on the dog. Might it take on some sort of special role? Will you get to play as the dog, maybe? Is the dog the only companion available? Questions! Aside from this, a lot of the discussion online is focusing on what the graphics in the trailer look like. Prior to the release of the trailer, there was a lot of finger crossing from people who hoped that Fallout 4 would not be a cross-gen game—the fear being that this could compromise the scope of the game in some way. Right now only modern consoles are confirmed, but there’s still some debate as to whether or not Fallout 4 looks good given how far into the new generation we are. Part of this fear about the visuals is spurred by games like Fallout 3 and Skyrim, both of which have not aged very gracefully in the visual department. While I’m inclined to agree that this first trailer doesn’t look super hot compared to recently released games, I also recognize that graphics are not really what defines Fallout for me—my favorite games are the old-school ones, and those look cheesy as hell now. They’re still fantastic, if not arguably better than the modern Fallout games. So, I’m not worried at all there. Plus, a lot of this trailer looked like it is in-engine, which is better than being fed something CGI and misleading.